Sushi Sora's location on the 38th floor of the Mandarin Oriental Tokyo offers sweeping views of the megalopolis. While hotels that offer top-notch scenery aren’t exactly scarce, some go the extra mile to ensure their restaurants, where reservations are available to both guests and outside diners, offer equally captivating visual experiences. When Sedona’s much-beloved Enchantment Resort was planning its recent $25 million renovation, it added floor-to-ceiling windows and wraparound patios so guests would have unfettered views of the area’s magnificent red-rock-dominated landscape. Che-Ah-Chi — the two-floor Southwestern-inspired restaurant that joined Enchantment in May — opens out to a panoramic showing of these red-rock formations. “We wanted to make sure that the guests felt like they were right in the canyon,” explains resort president Mark Grenoble, who oversaw the renovations, including the addition of Nana doors at Che-Ah-Chi to create a special indoor-outdoor dimension. Across the Atlantic in Porto, Portugal’s second-largest city, the restaurant at The Yeatman Hotel is celebrating its first Michelin star for its Portuguese seafood menu courtesy of Ricardo Costa, one of that country’s most notable chefs. The coup for Costa shows The Yeatman’s commitment to having one of the best dining rooms around, and this attention to superior quality extends beyond the kitchen. Situated along the Douro River, The Yeatman was destined from the beginning to have gorgeous views of the city’s historic center. Its fifth-floor restaurant has some of the most commanding vantage points at the hotel, especially if you are lucky enough to snag a spot on the terrace, where you can watch the flow of the river — the life source of the region’s famed vineyards. You can sample these very grapes at The Yeatman, whose cellar houses the largest collection of Portuguese wines in the world. 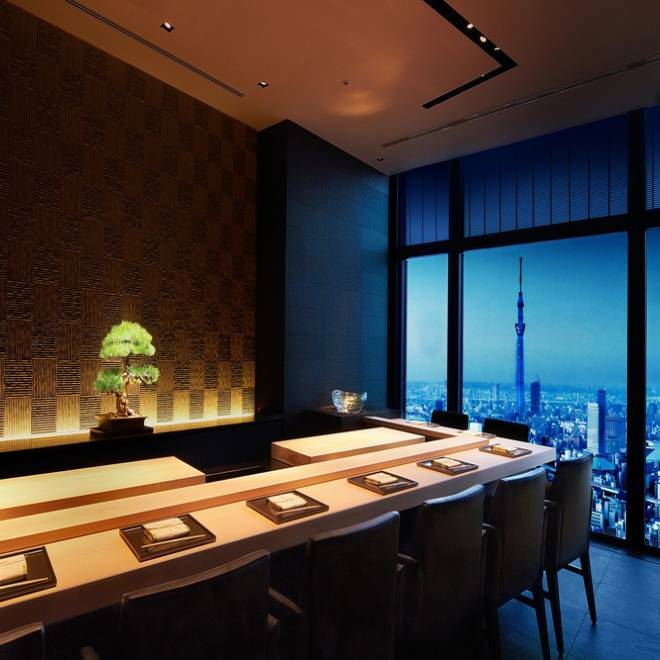 In Tokyo, the year-old Sushi Sora restaurant, on the 38th floor of the Mandarin Oriental, delivers stunning cityscape views that include the world’s tallest tower. Sushi chef Yuji Imaizumi serves up a rotating menu that reflects the changing seasons. “Eating seasonal ingredients while seeing the season in front of you is a special experience,” he says.